This mini dress made by Oljanna Cunneen for Nancy Vogel in 1970 merges ethnic folk tradition and contemporary fashion. The most distinct feature of the rust colored bonded wool dress is the multi-colored rosemaled design of crewel embroidery ornamenting the neck and hemlines. The A-line mini-dress style, with modish lines and raised hems, had rocked the fashion world and Vogel’s choice to include Norwegian design demonstrates her personal identity and business savvy at her Mount Horeb store, Open House Imports. When compared to the bunad costume made by Irene Gilbertson, both women used tradition—but quite differently. For a complete essay on this object, click here. Oljanna Cunneen made a dress for Nancy Vogel in 1970. A-line in shape and hemmed above the knee, the rust bonded wool dress features multi-colored rosemal designs of crewel embroidery. A close study of it suggests that while it held different meanings for Oljanna and Nancy, it represents both women—their sense of self and desires—as well as a time and place that looked to the past and the future. The rosemal dress then shows how an object can be both static and dynamic and help us understand individuals, society, and the ways they engage tradition. For Oljanna, the dress was a form of both fashion and custom, a practice through which the Norwegian-American expressed her identity. Born in the rural Dane County community of Vermont, Wisconsin in 1923 to Henry Venden, the son of Norwegian-born parents, and Gerharda Forshaum, who emigrated from Norway in 1908, Oljanna was hence the daughter of a kind of “mixed marriage” of Old World and New, as was her art. Her talents ranged from sewing, embroidering and knitting to painting, creating miniature troll figures, and rosemaling. Considering her body of work, it is easy to see that creating such objects was a means through which Oljanna constructed and shared her heritage. Moreover, Oljanna joined a community of Norwegian-Americans who shared her interest in a common ethnicity. In this way, the dress makes known the ways in which Oljanna identified as a member of an ethnic group. At the same time, the dress reveals how Oljanna stood apart from other rosemalers. When Oljanna rosemaled the dress, she adapted folk art to fashion in a way that was uniquely her own. Viewed in this framework, the rosemal dress reveals how creative traditional expressions of heritage can be. 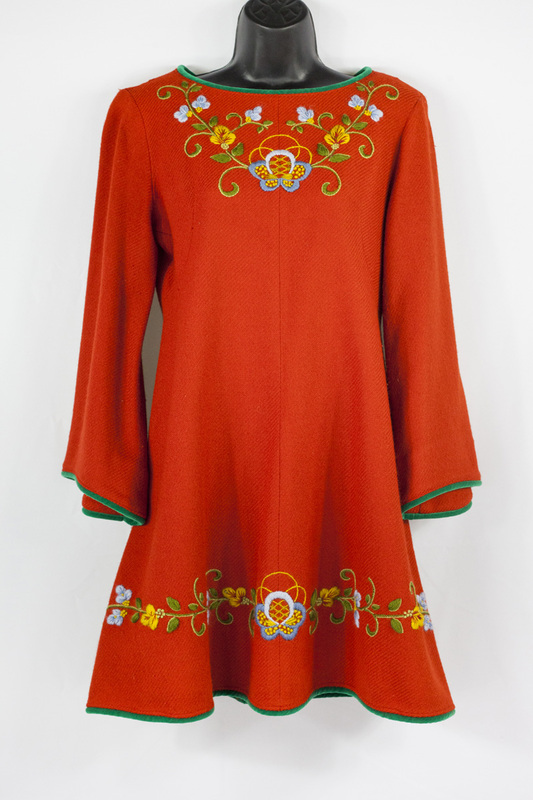 For Nancy Vogel—a non-Norwegian in a Norwegian community—this dress represents her desire to merge a traditional ethnic sensibility with 1960s fashion. Uncomplicated and thus ideal for mass production, the A-line mini dress was a staple of ready-to-wear. But since the rosemalled dress was made, rather than mass produced, it falls outside of the ready-to-wear category. Surely, Nancy could have asked Oljanna to embroider a bought dress, but the fact that Nancy commissioned Oljanna to construct and embroider the dress suggests that Nancy preferred the whole creation. The popular A-line mini dress was also a symbol of style that signaled a new feminine ideal, which assumed a young and economically independent woman for whom fashion was pleasurable, but time was limited. This subject was active, employed, and desired male attention. For such a woman, the A-line mini dress represented a new feminine ideal defined apart from motherhood. By 1970, Nancy was a 38-year-old mother and wife, placing her outside this new ideal. But as a working woman, Nancy fit squarely within the model. Seeing the rosemaled dress and its wearer as neither wholly aligned nor entirely separate from the 1960s notion of femininity shows how flexible the category was. Finally, considering Nancy’s involvement in the community, marked by dedication to a Norwegian heritage that was not her own, it is easy to imagine that she valued Mount Horeb, the people of it, and her place in it. Within that context, the dress can be seen as one of many efforts Nancy made to belong. Creators, Collectors & Communities by Individual Contributors is licensed under a Creative Commons Attribution 4.0 International License, except where otherwise noted.